Funded through the Avon Foundation, Sinai’s mammogram parties are for uninsured and underinsured women and are part of the larger “Helping Her Live (HHL) initiative. HHL exists to help battle breast cancer disparities that exist for Hispanic and black women by helping them get mammograms. What exactly is a mammogram party? Mammogram parties occur when a hospital sets aside a block of time for women to socialize and receive mammograms. Refreshments or a meal might be served and there are party games and breast health educational activities either immediately before or after each woman does her mammogram. How successful are the parties? 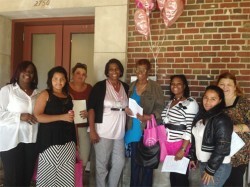 Sinai Urban Health Institute community health educators have hosted 11 mammogram parties, with 112 women attending in 2013. Mammogram party attendance rate was 83 percent, over 30 percent higher than the show up rate for daily mammograms. For additional information, call HHL’s toll free hotline at (877) 437-5432 or visit www.HelpingHerLive.org.